Conquer might be a bit of a strong word since my sewing machine and I often still have to agree to disagree... but this if more about my first sewing attempts. 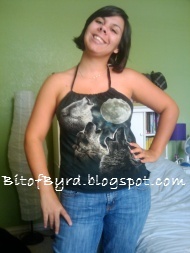 Christmas 2008, my mom bought a Brother sewing machine and decided we were going to sew aprons for our family members (I will try to get someone to send me a picture) They were the kind that the pattern already had the lines and everything so we cut... batted...sewed...and felt pretty good about ourselves. But this was really my mom's project and my help was limited in many ways to making the ties and turning them inside right. 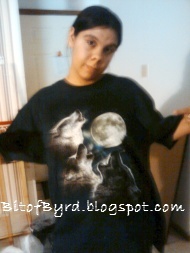 In the summer of 2009 I was introduced to the Three Wolf Moon Shirt, see the review there. This review meant I HAD to have that shirt! My sister needed one too... but mine... I wanted it to be different. I bought a pattern on sale from Joann's and I made my shirt.. it even has elastic in the back! 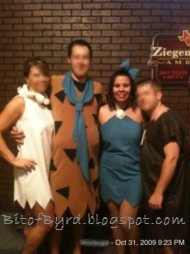 I was so pleased with it that when Halloween talk started going around I decided... 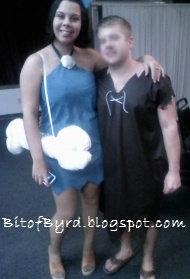 I can make my own costume! Only to realize I wasnt at a point where I knew how to sew with a lining yet... so this fabric... and this zipper didnt get used. 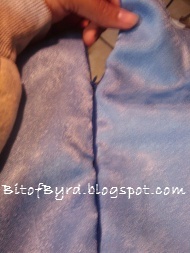 I did end up sewing two other zippers for Betty and Wilma's costumes and they came out great. That is when I found out sewing something for someone else was much easier than me because I could pin it on them... Wilma's dress only took 30 minutes to sew after pinned. I also made that giant bone purse! It was all on the fly, with no pattern and I LOVE how it came out, it was the perfect accent to the costume. So what was your first sewing project? How did it turn out? What did it inspire next? ps... yes it is 3am... insomnia is crazy and we dont get along! Long Weekend- Lazy or Productive? SPAM... love it or hate it?